I have always been a fan of knife combos. Are you asking why? Because this way I can get multiple quality knife for low price. And this exactly is the case with the Knives of Alaska Fishermans Suregrip Handle Fillet knife combo. For a reasonable price, you will get two excellent fillet knives made by one of the most popular knife makers in the US. Let’s take a look at the two filleters now. The combo consists of two fillet knives the Coho and Steelheader. Both are claimed to be made of 440C stainless steel. This type of steel is usually hardened to reach 58-60 HRC which means it’s really hard and it may take a bit more time to get the edge sharp, but it is well worth it. The main pro of such hard steel is the fact that it will hard edge for longer periods of time without having to sharpen it. Both knives are quite similar. 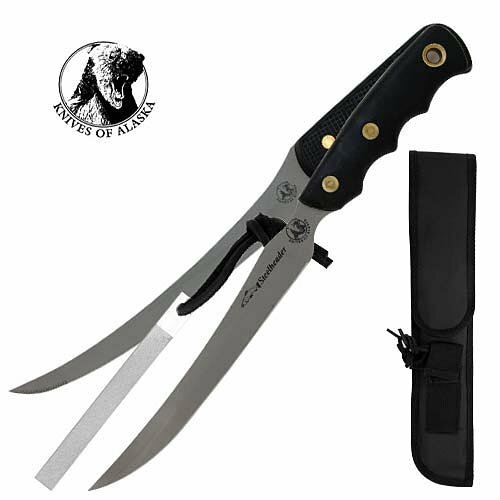 The smaller knife, the Steelheader, has 5.75 inch blade and it’s designed for smaller fish. It can also be used for other tasks in the kitchen such as deboning. The larger knife, the Coho, is fitted with 8.5” blade, and it’s designed for medium to large sized fish. It has full tang handle construction with two rivets. Being fitted with flexible blades, filleting with these knives is a breeze. The handle of both models is designed to prevent slippage, and the customers have confirmed that they had no problems with it. At the time of writing, this knife combo enjoyed positive reviews on Amazon. Most of the customers praised the knives for their excellent sharpness and edge retention. Some complaints have been made about the quality of the included nylon sheath. Of course a leather sheath would be much better choices, however it would also mean that the price would be higher. Given the price difference of the combo and the individual knives, I have to say this is an excellent choice, if you are looking to purchase high quality knives. With the blade lengths of 5.75 and 8.5 inches, you will be set for most fish filleting tasks. Excellen two fillet knife combo for a great price! Knives of Alaska Fishermans Fillet Knife Combo Review I have always been a fan of knife combos. Best Fillet Knife Buying Guide – 2015 Reviews Copyright © 2019.